and so much more! We’re also bringing back our awesome raffle, where you can win great prizes, provided by our favorite local businesses, including Bittersweet Treats, SporkFoods, The Golden State Cafe, Heath Ceramics, and your Los Angeles Dodgers. See you there! We’re very social! Chat us up on Facebook and Twitter. Can’t make it to the bake sale? Make a tax-deductible donation here! 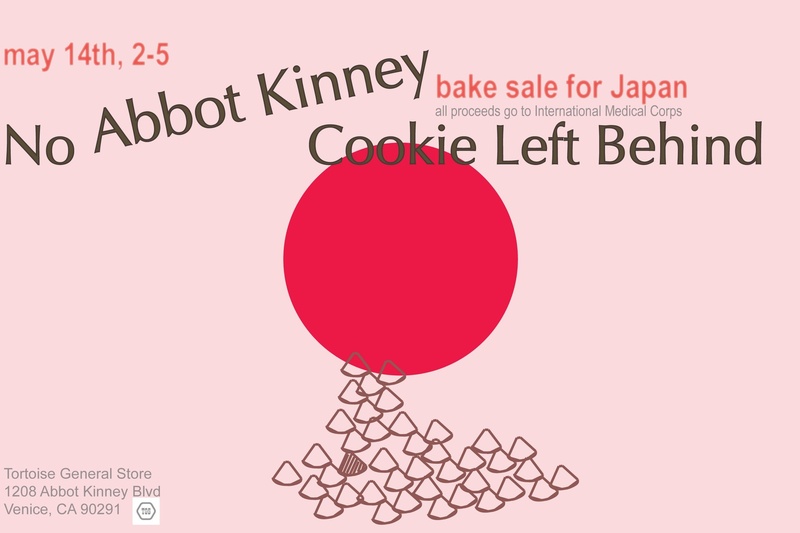 No Abbott Kinney Cookie Left Behind: A Bake Sale for Japan. We’ll be featuring a wide array of delicious sweets from from both professional kitchens (Gjelina, Platine Cookies, Theo Chocolate, and more) and home bakers. No Cookie Left Behind holds community bake sales, bringing together cupcakes, quiches, cookies, and the people who love them, to raise funds for charity. Over the the last 5 years, we’ve raised over $17,000 for Share Our Strength and Doctors Without Borders. 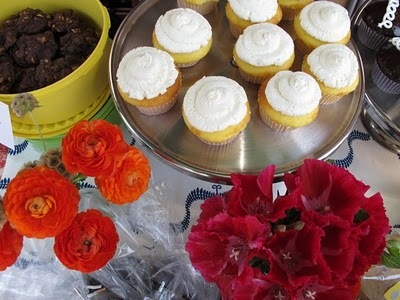 This bake sale is a special event for Japan, and all proceeds will go to the International Medical Corps. WHERE: Tortoise General Store. 1208 Abbot Kinney Blvd, 90291, in Venice, between Aragon Ct. and Cadiz Ct.
LOVE TO BAKE? If you love to bake and want to donate a few of your favorites, WE NEED YOUR HELP! Let us know and we’ll give you more information. SOCIAL NETWORKING: Invite your favorite westsiders to our Facebook event. Like No Cookie Left Behind on Facebook for updates on all our events. And hey, follow us on Twitter, so we can chat! Help us spread the word, go on, do it for Japan. QUESTIONS? Contact Jen Sall at thejensall@gmail.com if you are interested in donating baked goods, helping out on the day of, or if you have any questions. Another wonderfully successful bake sale came and went. Thanks to all the folks who helped in so many different ways, we raised over $4300 for Share Our Strength. We couldn’t be happier about it! Stay tuned for No Cookie Left Behind 2011! Prepare yourselves! It’s really really soon! On Sunday June 13, join us for the Fourth Annual No Cookie Left Behind Bake Sale, part of Share Our Strength’s Great American Bake Sale. Hot on the heels of our incredibly successful Cookies Without Borders Bake Sale for Haiti comes our annual bake sale. We’ve got a few new tricks up our sleeve this year. Get excited, people. WHAT: The No Cookie Left Behind Bake Sale is a community event that brings together cupcakes, quiches, and cookies, and the people who love them, to enjoy a summer day at Scoops and raise money towards eradicating childhood hunger in the US. Over the the last 4 years, we’ve raised over $10,000 for Share Our Strength and Doctors Without Borders. THE RAFFLE! We have amassed an incredible list of prizes for the first ever No Cookie Left Behind raffle. All the details coming soon, but expect prizes from restaurants like Pal Cabrón, The Golden State, and Sauce on Hampton, free organizing bootcamp sessions from Bneato, yoga packages from U Studio, and much, much, MUCH more. INCLUDING A TOUR OF THE SET OF GLEE!!! GUIDED BY ONE OF THE SHOW’S PRODUCERS!!! See details on all the prizes here. FRYSMITH! The Frysmith truck will be on hand to temper your sugar binge with their genius concoctions of deliciousness atop French fries. Salty and sweet — it’s a winning combination. 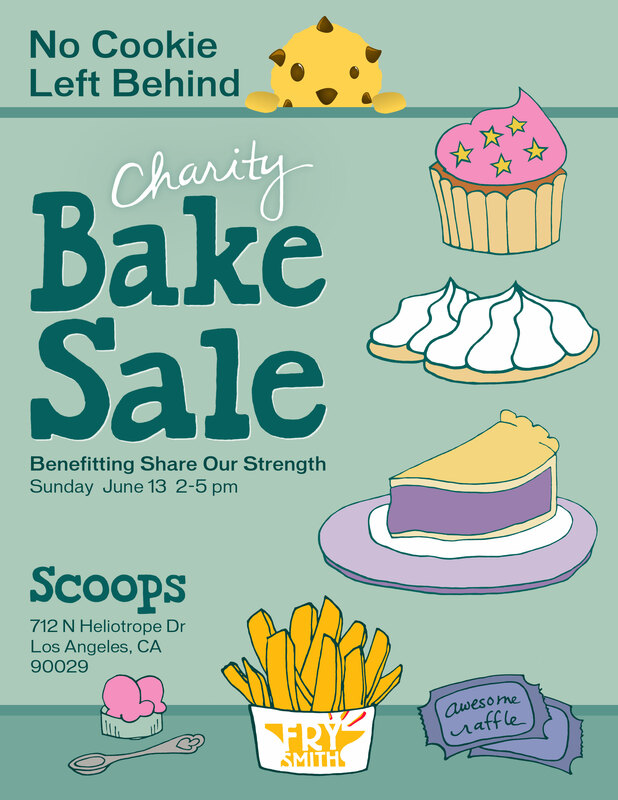 ALSO WHY: This is a convergence of Angelenos united because they like doing something good, spending a day in the sunshine, baking and eating sweets (and fries! ), being around delicious ice cream, and interacting with others who do the same. It’s a very special event, and a wonderful thing to be a part of. We could have just solicited for checks, but No Cookie Left Behind is about community. WHAT’S COOKIN’: Watch this space for details, but you can bet it’ll be delicious. 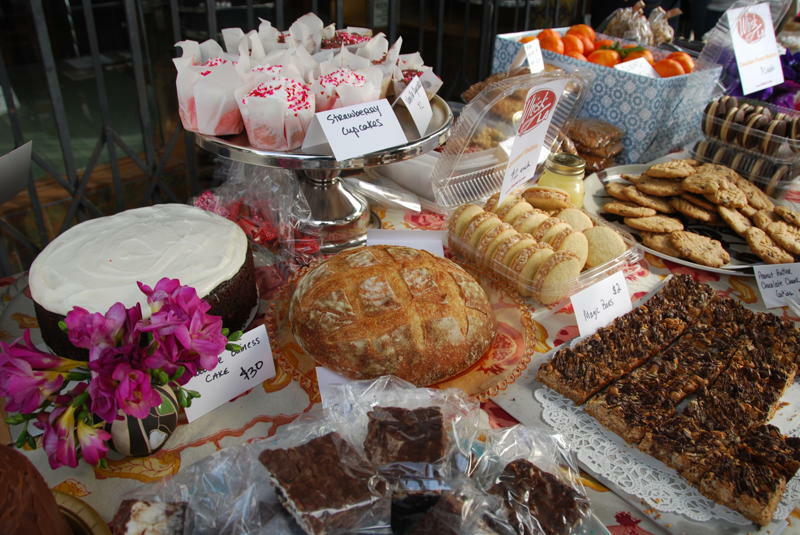 A vast array of baked goods from local business and extra-special home bakers, as well as a select group of homemade jams. This year we’ve even got small batches of pickled vegetables. QUESTIONS? 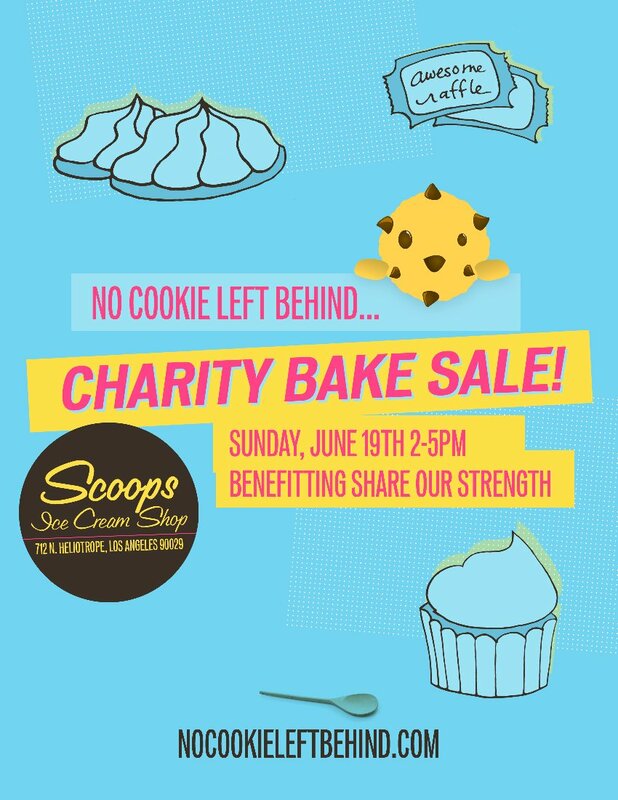 Contact us at nocookieleftbehind@gmail.com if you are interested in donating baked goods, helping out on the day of, or if you have any questions. See you on the 13th! We love you! Still a little tired, but utterly content, we can say that Cookies Without Borders was an unmitigated success. The humongous outpouring of delicious baked goods made for an irresistible and constantly changing spread. As the steady line of sweet-toothed angelenos made its way across the tables of sweets, we received so many “thank yous” for creating an opportunity to help out with the situation in Haiti. Now it’s our turn to throw out some thank yous. But, first some details. We had something like 50 different bakers make about 120 different items. We didn’t quite sell out, but I’m proud to report that at the end of the event, we donated what leftovers we had to Covenant House, a home for wayward teens not far from Scoops. As of today, we have raised over $5400 for Doctors Without Borders’ Emergency Relief Fund, and there are still a few donations trickling in. This is an awesome number, and everyone who contributed should be incredibly proud. What’s great about these bake sales is that each person involved contributes in whatever way he or she can, and each of these unique individual contributions is indispensable. We have many people to thank. First and foremost is Tai Kim, the owner of Scoops. He has been so very supportive and mellow as we take over his little ice cream shop each year. He is truly magnanimous and we’re so lucky that he is so very generous with his space, his energies, and his money: every bake sale my morning starts with Tai coming outside and asking, “Who should I make out the check to?” Having our bake sale at Scoops is a huge part of what makes it what it is. Then come the women behind the bake sale — this is most definitely a group effort. We started out with about 5 people back in 2007 — and have made one or two incredible additions each year. And again, each contribution is crucial: from coming up with the name “No Cookie Left Behind”, to creating our adorable logos, from procuring tables, tablecloths, flowers, labels, packaging and more, to writing a compelling press release and blasting it to a vast list of local media, from manning money, to conjuring a professional sign out of thin air at tee-minus-two-days, I’m pretty convinced that these girls can achieve anything. And they’re so pretty! So, Logan Clare, Annie Crowninshield, Rachel Gandin, Heather Goldberg, Jenny Goldberg, Jodi Hildebrand, Ann Le, Jessica Smith, Peggy Tachdjian, huge thanks! You guys are extraordinary. So, what can we say? We are hugely grateful. I’ll leave you with a great write-up from Monday’s LAist, and stay tuned for No Cookie Left Behind in June — we’ve got a few new tricks up our sleeve. UPDATE: Due to overwhelming response from our city’s amazing home bakers, we’re extending the bake sale an extra hour so we can sell all the goods! 2 – 6 pm! Hey Los Angeles! The ladies of No Cookie Left Behind are proud to invite you to Cookies Without Borders: A Bake Sale for Haiti. We know about earthquakes here. Very few of us have ever experienced one as strong as 7.0, but we can only imagine the lasting devastation affecting every aspect of life in Haiti after such a huge tremor. Please join us in doing what we can (baking cookies, eating cupcakes, hanging out at Scoops, raising money) to help out the people of Haiti. We will be featuring a dizzying array of sweets from both professional kitchens (Spork Foods, Whisk LA whoopie pies, and Bitter Sweet Treats, Valerie Confections, Large Marge Sustainables) and and local homes, as well as a few jars of choice homemade jams, and all proceeds from the bake sale will go to Doctors Without Borders‘ Emergency Relief Fund. Doctors Without Borders a Nobel Prize-winning international humanitarian organization working to meet the overwhelming medical needs of post-earthquake Haiti and throughout countries where survival is threatened by violence, neglect, or catastrophe. WHEN: Sunday, January 31, 2010. 2 – 5 pm 6 pm! LOVE TO BAKE? If you love to bake and want to donate a few of your favorites, WE NEED YOUR HELP! Let us know and I’ll give you more information. CAN’T MAKE IT? If you can’t make it to the bake sale, but still want to help out, you can mail a check directly to Doctors Without Borders. 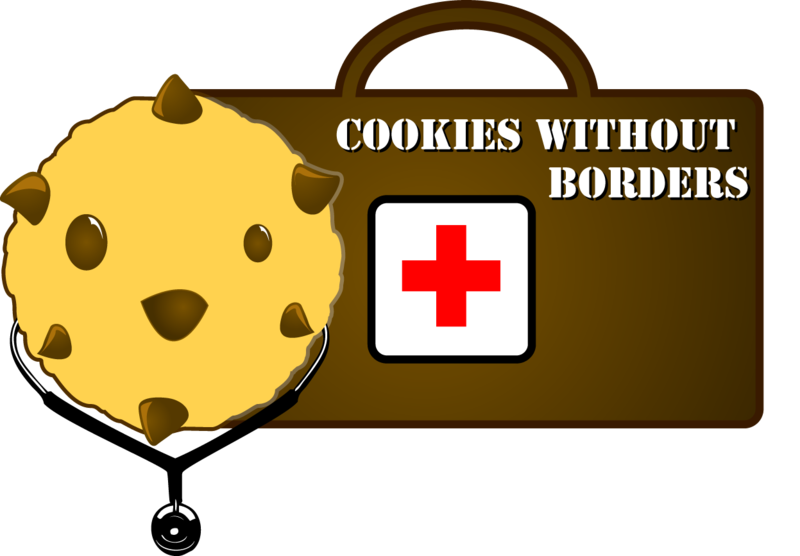 Please write “Cookies Without Borders Bake Sale” on your check so they know we sent you! 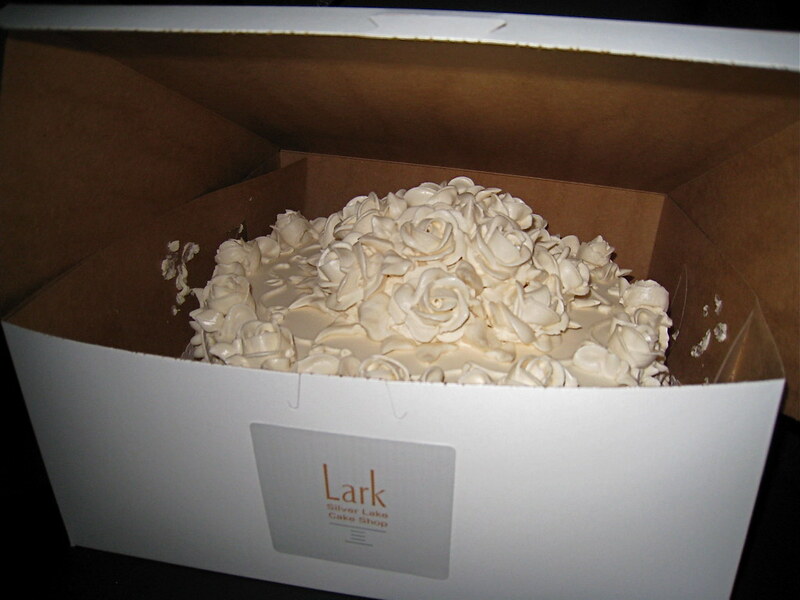 Last night I picked up 2 gorgeous cakes from Lark Cake Shop: one chocolate mocha, and one coconut cake that is simply breathtaking. The decoration on this cake alone is so beautiful, and so intricate that it must have taken forever to achieve. And it’s Lark, so no doubt it’s completely delicious too. This is a cake for a very special occasion. One person is going to be very lucky to have it today! I also picked up adorable ‘cakewiches’ and L’il Merris — oatmeal cream pie sandwich cookies filled with maple buttercream from CakeMonkey and lemon rosemary shortbread from Large Marge that was smelling pretty irresistable in my car. This morning I’ll be getting a slew of mini and baby bundts from Kiss My Bundt, then I’m off to Scoops. So much more coming, too! The whole city must be baking for No Cookie Left Behind! And in yet another No Cookie Left Behind miracle, guys, the sky is blue today!!! I was on the verge of tears as I walked out of the supermarket yesterday morning to drizzles, but judging from early reports outside my bedroom window, after weeks of grey and gloom, looks it’s going to be one of those gorgeous Los Angeles day-after-rain days! Perfect weather for a bake sale.